What else would it be for? I’m a romantic at heart and I always will be. I write romance novels because I believe in happily ever afters. I LOVE getting to give my characters a happily ever after every time I write a story. I don’t like reading stories with sad endings and there’s no way I want to write one. I LOVE my characters. I’m way too attached to them to let something really bad happen to them. Sure they may go through a bit of tough times, but in the end, things are going to go their way, at least in love. 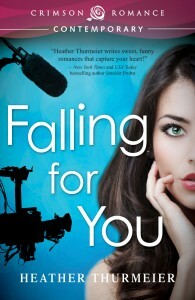 Here’s a little romantic excerpt from my book FALLING FOR YOU. help it. Cassidy was simply too much to resist.